The Rocket 600 series are the industry’s first SATA 6Gb/s host adapter based on PCI-Express 2.0 technology. The Rocket 600 series delivers the next generation of SATA performance with robust SATA connectivity. The Rocket 600 series are the internal and external low-cost SATA 6Gb/s host adapters. They are fully industry standard AHCI (Advanced Host Controller Interface) compliant and deliver Out-of-Box Ready installation for numerous operating systems. The Rocket 600 series is backward compatible to PCI-Express 1.0 technology and SATA 3Gb/s and 1.5Gb/s devices. They use the same cable and connectors as previous SATA generations to ease integration. SATA 6 Gb/s Compliant The HighPoint Rocket 620 features next-generation SATA Revision 3.0 compliant internal SATA ports to provide 6 Gb/s data transfer rates for optimal performance, efficiency, convenience and flexibility. 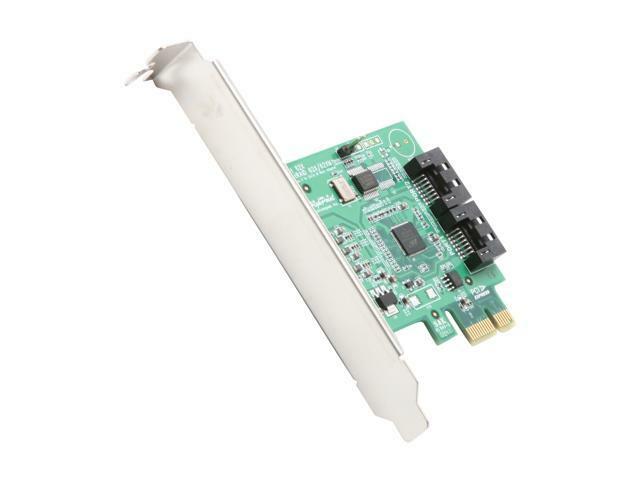 PCI Express 2.0 Interface The PCI Express 2.0 interface provides double the bandwidth of the existing PCI Express 1.0 interface and delivers at least 500MB/s of throughput for enhanced performance. PCI-Express 2.0 (Compatible with PCI-Express 1.0). Compatible with SATA HDD, SSD, etc. Power Efficient – Going Green Saves Green. View other products from HighPoint Technologies, Inc. This item is covered by Made PC Return Policy. Pros: One of the faster eSATA RAID card I tested with my ProBox 4 bay external raid box. Supports eSATA replication out of the box*. Cons: One of the slowest posting cards I have ever worked with. Takes full 30 seconds just to post and detect the drive array. *Detected all 3 of my WD 3gb green drives out of the box, but after a firmware update, would only see 2 drives no matter which bays they were in. Other Thoughts: I needed a bunch of extra storage for archiving very large files so I opted for the 4-bay RaidBox and installed 3 drives, leaving room for some future expansion. My Asus Sabertooth x79 has built in eSATA but the transfer rates were abysmal - around 20mb/s. tried a couple other cards (including the one made by the RaidBox people) and was able to get it up to about 40mb/s but that wasn't good enough. I finally got to the RocketRaid controller and it worked quite well, providing transfer rates up to 180mb/s. Great! But on post, this thing shows firmware from 2010 and the post time was a full 30 seconds so I thought a firmware update may be in order. I downloaded the v13 firmware from their web site and after flashing it, it did nothing for the post time, and although the post screen showed a 2015 date, the card was now only seeing 2 drives in the ProBox instead of 4.Not even windows would see all the drives with the drivers installed. Only two would be visible regardless which bays they were in and the flash utility did not backup the old rom. The MFR site only provided the latest firmware so I had to search over hell and high water to find V11 of the rom and hope it got me working again. It did but I was back to the 2010 firmware, however the older flash utility backed up the rom before flashing. Funny. Don't bother with phone support, they won't answer. You have to register your device and create an account on their web page to get support. You may get it but good luck with that. They eventually replied and said they would look into it. I don't expect them to. Pros: Drop in for Linux. Just works with the AHCI driver. ZFS yields 105 Mbyte/s for raidz. Perfect to add more ports to support Linux RAIDs. Lowest price solution. Cons: Be careful not to order the RAID version of this controller if you want to use ZFS. Pros: Cheap, fast, able to get 120+ MiB/sec or so off both ports simultaneously with traditional HDDs which is about the max to be expected. Able to get 500+ MiB/sec off one port with an SSD. Works great with FreeBSD 10.1. Give that a single PCIe 1x lane can do up to about 625 MiB/sec theoretically, this card could likely support up to four traditional HDDs (which typically cap out around 120-130 MiB/sec anyway). You'd need to use two port multipliers but those appear to be supported. For SSDs I'd suggest only putting a single SSD per card with these (I bought two for this reason) as two SSDs could easily saturate a single 1x lane and thus become a bottleneck. Pros: Worked on my last 2 motherboards. Cons: Won't work with my new ASUS SABERTOOTH 990FX R2.0. Other Thoughts: Initially, I bought this for a small computer so I could add a couple of SATA drives. It worked just fine. Then when that computer died, I moved it to another computer, and it worked again. Then when that machine died, I upgraded it to a ASUS SABERTOOTH 990FX R2.0, and now the Rocket hangs the computer at the BIOS screen. I put it in both a x1 and an x16 slot, same thing. Pros: Good price - was on sale for 16 bucks. Cons: lasted only 17months ! Cons: Documentation and HighPoint site lists card as Linux compatible. That information is incomplete. Card is Linux comptible...up to kernel 3.6. HighPoint has not updated their drivers for the RR6xx series in almost 2.5 yrs and will not do so unless market forces dictate otherwise. Other Thoughts: Linux users be warned...this is not a PlugNPlay card. Requires manipulation of driver source files driver and building against current kernel. Doesn't stop the boot process when a device isn't plugged in. Other Thoughts: I have a monster dual quad computer with lots of memory and graphics; plenty of power to last what I do for a few more years. The downside? This is one of the first Dell workstations to include things like pci-e 2.0 and lots of SATA ports. I have already discovered several 2.0 devices that don't like this MoBo (MotherBoard). The MoBo is SATA-1. none of the 8 SATA ports support SMART data, and my e-SATA bracket stops the BIOS boot process everytime if I don't have my external drive plugged in. Great system with a few faults that rarely bother me (I don't slam the disks that hard to need faster read/write most of the time). I just got a brand new 500MB/s read/write SSD as a gift and was very sad to see me struggling to get 135MB/s read/write out of the benchmarks. I was /really/ hoping to get a huge boost with this card. Instead I get 205MB/s read and 128MB/s write. This tells me that I am really only getting pci-e 1.0 speeds out of the device/MoBo combo. I was really hoping for more, but I can't blame the device for my old MoBo. I am willing to give up the slight write decrease for the boost in read. Also, I love the fact I have SMART data again! And the biggest plus for me, I don't have issues with the BIOS hanging when I forget to plug in my external SATA drive into the e-SATA port! In short, not quite as fast as I was hoping, but I get enought benifits that I am quite pleased. OS's tested Debian (Wheezy) Linux and Lubuntu 13.10. No issues in the slightest so far.